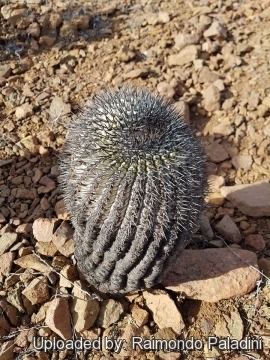 Copiapoa melanohystrix should be distinguished by its more long and stout black spines and blackish felted areoles that give the plant a very intriguing dark overall. Origin and Habitat: Esmeralda and adjacent areas. Habitat: It grows in areas where very little else grows. 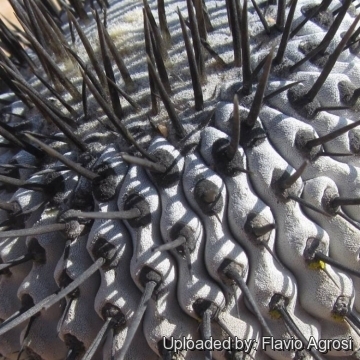 It's a very drought tolerant species. Despite the lack of rain where it lives, the extreme aridity is attenuated by the frequent, often dense, coastal fogs. The fog tends to shows a recurrent pattern; usually it is overcast in the early mornings, the clouds dissipating during the late morning and returning during the late afternoons. 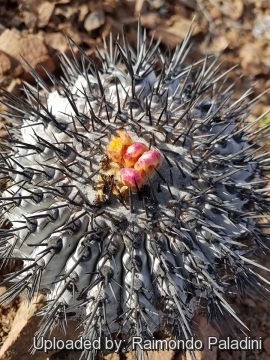 Even though the temperatures are moderate in the summer as well, the light on sunny days is so bright and burning that most Copiapoas are covered by a white waxy surface which protects the plants from the sun and reduces the evaporation. The wax gives the plants a characteristic, whitewashed look. The waxy coating is only created if the plants are exposed to ultraviolet rays and will only be created sporadically under glass in a greenhouse. 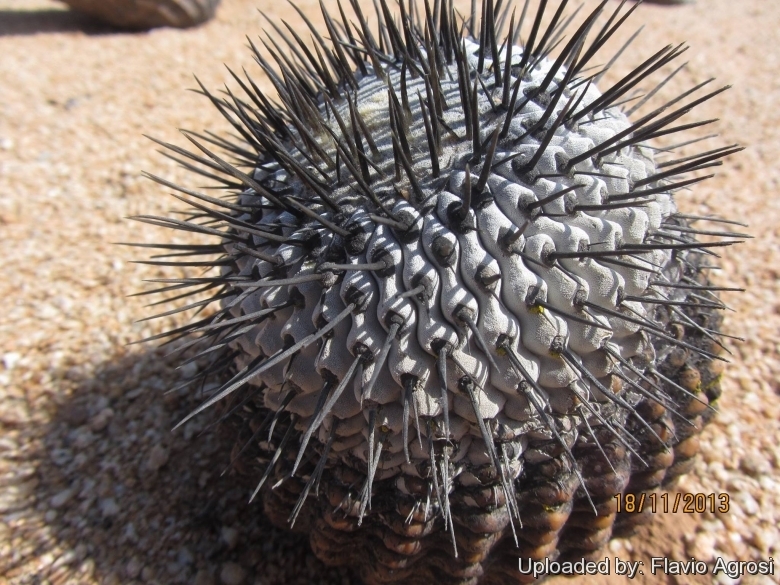 Description: Copiapoa melanohystrix is one of the many forms of the very variable Copiapoa cinerea/Copiapoa columna-alba complex. It is still unclear whether this variable complex is one or several species. There is so much variation that most authors choose to lump them together. 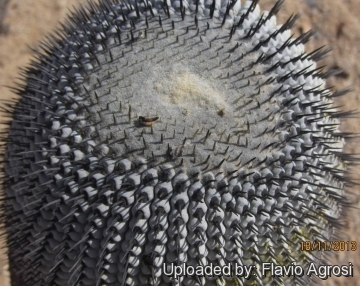 Copiapoa melanohystrix should be distinguished by its more long and stout black spines and blackish felted areoles that give the plant a very intriguing dark overall. 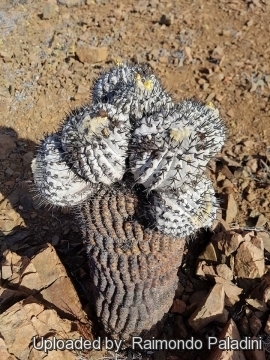 It can be referred to a form or clonotype within the variability of Copiapoa columna-alba. This form is more decorative than the standard Copiapoa cinerea and one of the showiest of all cacti. Habit: Usually solitary, forms white columns with dark contrasting spination. Stem: Variable 50-75 cm tall, 10-20 cm in diameter, epidermis covered with a thick stratum of ashy-white pruine. Apex flattened with abundant dark-grey wool and without spines. Central spines: 1-3 sub-erected, strong, more than 2 cm long, black. Flowers: Diurnal closing at night, protracting the period of opening many days and arising on the crown, often several at a time, funnel form, small (2-3 cm long), yellow, scentless. Fruit: Deeply concealed within the apical wool, round or egg-shaped, pale green reddening toward the apex, almost naked with only few (3-4 mm long) scales. Almost completely dry at maturity. 5) Urs Eggli, Leonard E. Newton â€œEtymological Dictionary of Succulent Plant Namesâ€ BirkhÃ¤user 2004. 6) F.Ritter â€œKakteen SÃ¼damerikaâ€ 3: 1072 1980. 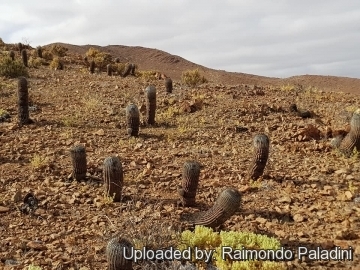 Cultivation and Propagation: Considering that Copiapoa melanohystrix comes from a habitat with an extremely arid climate, they are remarkably tolerant of pot culture. These plants have taproots and are susceptible to overwatering. They requires also an appropriate air circulation. Copiapoas are summer grower species easy to cultivate. Hardiness: Not highly tolerant of a great deal of frost. They need to be kept in a cool place during winter rest and are resistant to light frost if kept on the dry side prior to, and during, cold weather ( they are hardy to -2 C Â° C short periods). However some warmth throughout the year will increase the grower's success (minimum 5Â° to 10Â°C during rest season). 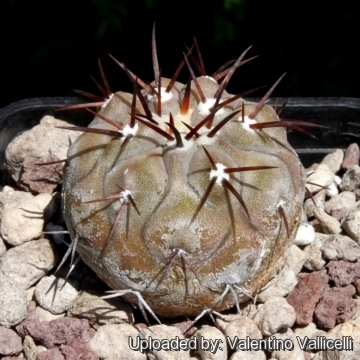 - Rot: Rot is only a minor problem with cacti if the plants are watered and â€œairedâ€ correctly. If they are not, fungicides won't help all that much. To prevent rottenness it is also advisable to surround its root neck by very rough sand or grit, this help a fast water drainage. 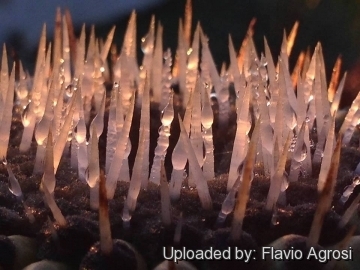 Propagation: Seeds (or offsets if available), Grafting is often used to speed growth rate and to create a back-up to plants in collection. Seeds germinate in 7-14 days at 21-27Â° C in spring, remove gradually the glass cover as soon the plants will be well rooted (ca 1-2 weeks) and keep ventilated, no full sun for young plants!